Thank you for being a part of the 51st annual Southern Christmas Show! Though originally from South Carolina, I have lived in Charlotte since 1989, which also means that attending the Southern Christmas Show has been a tradition in my family for many years. I had the privilege of working for Southern Shows for eight years (2003-2011) as a Show Manager for the Southern Women’s Shows in Memphis and Orlando. I joined Marketplace Events in 2016 as the Brand Manager for our portfolio of Holiday Shows. 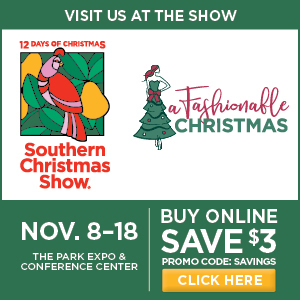 I am now Show Manager for the Southern Christmas Show and the Southern Spring Show—two community institutions held each year at the Park Expo & Conference Center. I am particularly excited to have the opportunity to work on the finest Christmas Show in all of North America. It is an honor to work on such a beloved event. I look forward work with you, our valued exhibitors, for many years to come. Many of you have reached out to us asking if we have a source for temporary help… apparently some of you need a few more Elves to work your booth at the show! We’ve created a little something that we hope will be of assistance to you: the Southern Christmas Show Job Board. Here you can post your onsite Help Wanted listing for free. Saturday, November 3: 8:00 a.m. - 5:00 p.m.
Sunday, November 4: 8:00 a.m. - 8:00 p.m.
Monday, November 5: 8:00 a.m. - 8:00 p.m.
Tuesday, November 6: 8:00 a.m. - 8:00 p.m.
Wednesday, November 7: 8:00 a.m. - 2:00 p.m.
All exhibits must be fully set-up by Wednesday, November 7 at 2:00 p.m.
Exhibitors may not begin to move-out or dismantle any part of their exhibit before 6 p.m. Any exhibitor whose display is not intact at 6:00 p.m. will not be invited to return the following year. Sunday, November 18: 6:00 p.m. - 11:00 p.m.
All exhibits must be moved out by Monday, November 19 by Noon. Monday, November 19: 8:00 a.m. - 3:00 p.m.
All exhibits must be moved out by Monday, November 19 by 3:00 p.m.
CLICK HERE for the 2018 Southern Exhibition Services' Exhibitor Services Kit! **Deadline to receive advance pricing is October 17, 2018. Exhibitors can order electricity, phone and internet through the The Park Expo and Conference Center. Click here to order your services! **Deadline to receive advance pricing is October 26, 2018. Storage can be rented through The Park Expo and Conference Center. Please call Henry Mills at 704.274.0220 to book storage. If you plan on provide food or beverage samples in your booth or sponsorship area, please click here to fill out the The Park Expo & Conference Center's Request for Food and Beverage Sampling form. Click here for our Traffic Drivers page.